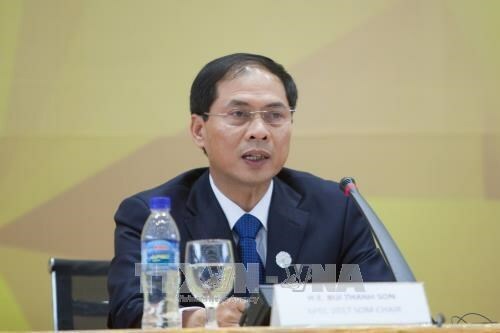 Standing Deputy Minister of Foreign Affairs Bui Thanh Son paid working visits to Singapore and India from June 21-22 to step up cooperative ties with the two countries. In Singapore, the Vietnamese official met with Senior Minister of State for the Ministry of Defence and the Ministry of Foreign Affairs Mohamad Bin Osman. They applauded strong development of the strategic partnership, saying Prime Minister Nguyen Xuan Phuc’s official visit to the country in April helped increase mutual trust and create a new impetus for the bilateral ties. They agreed to enhance coordination to organise activities to mark the 45th anniversary of the diplomatic relations, step up security and defence cooperation, and further cooperation in regional issues and at multilateral forums. The officials stressed the need to accelerate the ASEAN Community building in 2018 when Singapore takes on the ASEAN chairmanship. Also, both sides were unanimous to foster collaboration in the fields of economy, trade, investment, tourism, science-technology, and education-training. They will work to encourage Singaporean businesses to pump investment into industry, renewable energy, smart city, digital economy, and startup in Vietnam. While in New Delhi, Son and his Indian hosts, including Minister of Commerce and Industry Suresh Prabhu, Minister of State for External Affairs Vijay Kuma Singh, and Deputy National Security Advisor Rajilder Khanna, said that the comprehensive strategic partnership between the two nations is built on the traditional friendship and mutual trust. Both sides reached consensus on translating agreements reached during the visits of President Tran Dai Quang and Prime Minister Nguyen Xuan Phuc to the Southern Asian nation earlier this year. They consented to promote collaboration in defence and security and support each other in regional and international matters as well as at multilateral forums like the UN, the Asia-Europe Meeting (ASEM), and ASEAN-India dialogue. As two-way trade has developed rapidly with the revenue of 7.6 billion USD recorded in 2017, they agreed to work to lift the value to 15 billion USD by 2020.